OK – this is the information that everyone’s been waiting for: How the OrganizedPlay Tournament System for Battle Dice will work and how to be a part of the program! All of the OP functions of the site are accessed by clicking the “Tournaments” link on the left navigation menu. Once you click that link, a number of sub-menu items will be displayed. Those menu items are referenced in the following instructions. Anyone who wishes to host tournaments must begin by becoming a Tournament Organizer. Click the “Become a TO” link and fully complete the signup process. Every day or two we’ll inspect the submissions and approve them. Everyone who applies will be approved. Once you’re approved, you’ll get a confirmation email. That email has important instructions regarding your duties and responsibilities as a TO. Be sure you keep it. To submit a tournament for sanctioning, click the “TO Login” link. That will take you to a screen with several additional Tournament Organizer functions. If you have any questions about how to use these functions please contact us immediately. We also recommend that you sign on to the OP-TO-L mailing list so that you’ll be sure to get updated information on the OP system. We will review tournament sanctioning requests every business day. All submitted tournaments will be normally approved, unless for some reason we find the site fails to conform to the terms required for use (a public space, etc.) When your tournament is approved you will get a confirmation email. NOTE: Prize support for tournaments is still in production. All approved tournaments will receive prize support, but the kits may not reach you before the tournament runs. Be sure to keep contact information for everyone so you can get their prize support and ID cards to them after the event. By the end of May we expect to be sending out prize kits once a week, with a 3-4 week lead time; that means that you’ll need to sanction your tournament 3-4 weeks before it runs to ensure you get prize support. For the time being, prize support will only be sent to US and Canadian addresses. International support is planned for a later date. NOTE: If you do not receive prize support prior to your tournament, please contact us directly via email to ensure that it was sent; we’ll let you know if your support kit was mailed and on what day. NOTE: The first legal date to run a sanctioned tournament will be MAY FIRST. However, as described above, you will not receive prize support in time for that tournament. YOU will be responsible for tracking your player’s information and getting that support to them when it arrives. Good luck – and let the games begin! The Battle Dice Team was at the Game Manufacturers Trade Show in Las Vegas the week of March 13th. 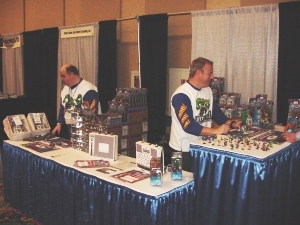 The GAMA Trade Show is a place for specialty (hobby game) retailers to meet specialty (hobby game) publishers. The week-long event features an exhibition hall, seminars, hosted breakfasts and dinners, and lots of industry networking. Because Playmates is primarily a mass market toy & game company many specialty retailers were unaware of the game. We had a great time doing demos and introducing many new stores to the game. We did more than 100 demos and brought home contact information on more than 75 potential new locations for the game. We also announced the Tournament Kits and the OrganizedPlay support for Battle Dice. OP is a big part of the specialty retail strategy, and it will help those retailers sell Battle Dice and generate lots of local support. Here’s a last shot of Dave and Pat after a long week in the booth – tired, but triumphant! Announcing: Marvel Battle Dice Organized Play! First revealed at GAMA in Las Vegas to very enthusiastic response, Playmates, Inc, is happy to announce the official Organized Play system for Marvel Battle Dice! Toward the end of next month, a new section of the website will go live which will allow players to register and track their progress against others all over the US, and soon the world. There will also be a system for finding retailers in your area which are running registered events and regional MBD activity, bragging rights and everything else you’ve come to expect from Organized Play. None other than Red Skull, She Hulk and the Silver Surfer! That’s right, everyone who participates in an official tournament will receive a mail-in redemption voucher for their choice of a FREE Red Skull or She Hulk! Win, lose or draw, either the Skull or She Hulk will be yours, just for playing. What about Silver Surfer, you ask? Well, being a Cosmic level character, we needed to make him a little more special. So, for the Surfer to be yours, you’ll need to show some skill. First prize for winning a tournament is your FREE Silver Surfer. He’ll be placed into your hot little hands right there at the end of the event, since he comes with the tournament kit! Soon to be the hallmark of superb players everywhere, the Silver Surfer will be exclusive to tournament winners and a badge of merit among Marvel Battle Dice players everywhere! So keep an eye on this site and the MBD forums for updated news as the official Organized Play system comes closer to live status. And start practicing! The “M.I.A. Three” – Revealed! Since the Red Skull, She Hulk and Silver Surfer continue to remain extremely elusive, I figured I’d give everyone a sneak peek at their in-game abilities. 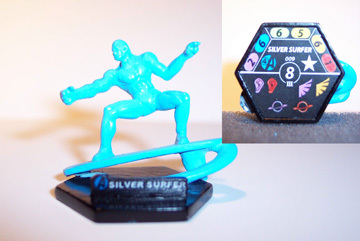 Also, check out the unpainted Silver (Erm, Blue) Surfer prototype! If you’re absolutely intent on including any of these characters in your games, with your opponents permission to proxy them in, here’s what you need to know. And, no, the rumors are not true that this is some sort of AIM cover-up plot to keep Red Skull from getting the beat-down in games. The fact that MIA is AIM backwards is a total and complete coincidence. Really. Do Dice Powers Play a Big Part in Your Team Building? © 2019 Marvel Battle Dice. All rights reserved.